n part 2 of the historical journey through World War II as seen through the eyes of a young Navy man, we will explore combat aboard both the USS Arkansas and the USS O’Brien. 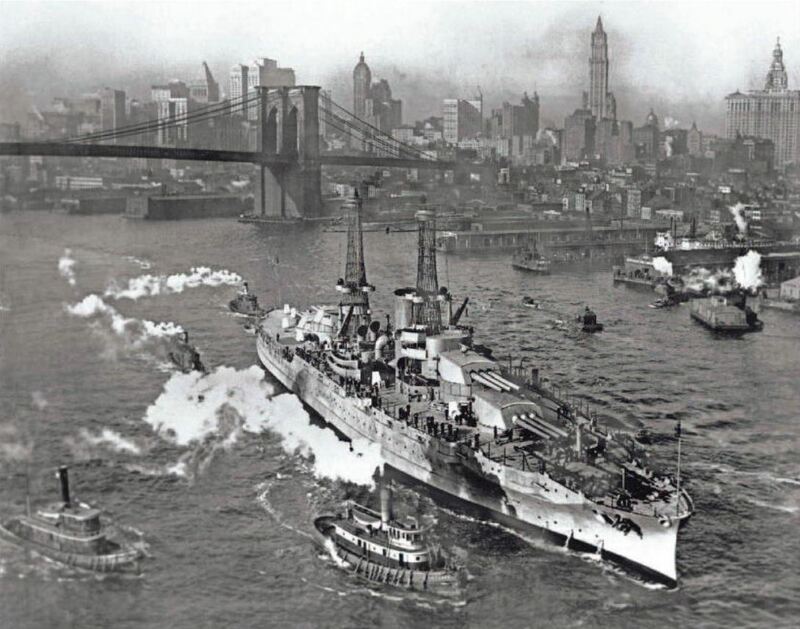 USS Arkansas leaves New York Harbor in this photograph. The ship was active in both World War I and World War II. Charles Jacobus of Smyrna carries an English name first identified by King James I in 1605. Jacobus’ surname is translated into the meaning “held by the heel.” Yet, this soldier ran by his heels with courage and patriotic zeal to serve our country and protect the freedoms we have today. In 1943, Charlie was transferred to the USS O’Brien. His destroyer was a small ship of 376 feet and commissioned in 1944. The ship was narrow, with the beam (broadest part of the craft) at 40 feet. The USS O’Brien was built for speed to fight underwater targets. The ship moved around a task force to protect them on their mission. The USS O’Brien was also successful in transporting vital food in a whaleboat to soldiers at night. In the first year on the USS O’Brien, the destroyer traveled 65,139 miles. In World War II, there were 554 destroyers. The USS O’Brien (DD-725) was named for Capt. Jeremiah O’Brien, who conducted the first naval battle of the American Revolution. This battle-weary ship was a rare survivor of a 6,939 armada storming Normandy beaches. The USS O’Brien held 350 seaman, and Charlie referred to them as a “family.” He was the baker on this ship and served delicious bread and pastries by day while working as a gunner by night. Charlie operated a Bofors 40-mm gun on the USS O’Brien. He had no formal culinary training at the time, but he had worked in the kitchen in his Memphis orphanage with an older woman, who was kind in teaching him skills he used over a lifetime. Charlie worked with the ovens while the troops were in slumber and provided a feast for his fellow comrades. He baked one loaf of bread per man, and his treats included delectable cobblers, donuts and cinnamon rolls within 17-by-27 pans. Cakes were baked on the back of old metal pie pans. His galley (kitchen) was 10-by-12 with deck ovens and two commercial stoves. Charlie used a stainless steel sink as a bowl to mix yeast dough that had to sit and rise. Afterward, he baked 40 loaves at a time. The skipper on board referred to Charlie as “Jake” and often ordered a two-pound loaf of bread with thick butter on the side for his supper alone. On the USS O’Brien, Charlie awakened at 5 a.m. and began cleaning as the first order of the day. He lived below deck in a 6-foot-long bunk with just enough room to turn over. One room held 30 men. With the ship short on fuel, the interior sleeping quarters shook all night and offered little rest. It was hot in the South Pacific, and Charlie preferred to stay above deck on many evenings for cooler accommodations. When he slept topside, he used a canvas and wore a life jacket. His locker was on deck and contained a sea bag, hammock, two blankets and pillow, all wrapped into a bundle. Charlie escorted the first waves of ships into a Normandy landing for what was codenamed the D-Day Overlord invasion from June 6-13, 1944. On June 6, he was aboard USS Arkansas at 5:52 a.m. and posted near large cliffs where Army Rangers were positioned high as not to be seen by Germans. When the Rangers called for fire to shoot a target, Charlie’s crew opened up with their guns. He was told nothing leading up to the Normandy invasion and did not know where he was headed until the arrival was in motion. USS Arkansas had 5-inch, 38 caliber naval guns with a five-mile range. His ship was at the Normandy landing just off Omaha Beach where he served as gunner, while bigger ships fired over him. The primary goal was to stave off German attacks. Charlie witnessed one ship in his squadron literally break in half, as Germans dropped a bomb hitting its center. On this historical day, Charlie saw bodies floating with no one attempting to pick them up in the cold and choppy currents. Circumstances for immediate rescue on this day were quite dreary. After Normandy, Charlie moved in to Cherbourg in Lower Normandy, France, and remained there from June 22 to June 30, 1944. His ship was cruising behind mine-sweeps. He took part in bombardment of the port of Cherbourg, engaging shore batteries on June 25, 1944. Fighting the Germans, Charlie was on gun-watch and opened up on the Nazis. In turn, the USS Arkansas was fired upon by 11-inch guns. Four ships in his task force took hits, and Charlie’s ship received live projectile. Fortunately, both primer and detonator had been removed, and his ship received a dud, saving his life. In all, 20 men in his fleet were killed with one projectile. The Allies were victorious in this overall endeavor and defeated the Germans, but with a high price. The United States had 22,000 casualties and Germany suffered 38,000 casualties. Of this moment, Charlie related, he was “only a kid until firing at the enemy, when he grew up.” With each battle and funeral, he became a man. The emotional toll was often unbearable. He credited deep friendships in the Navy as his salvation, allowing him to move ahead and finish the war with honor. From Cherbourg, Charlie was at sea four days while returning to the United States for repair of his ship, as radio sonar was not working. In a matter of days, he returned to the Pacific via Honolulu. Afterward, in early December 1944, he found himself in the Pacific forging through the Philippines on the USS O’Brien and landing in the opening of the Leyte invasion. The Battle of Ormoc Bay in the Camotes Sea was an incredible venture Charlie witnessed firsthand. He also beheld the sinking of the USS Ward, which sank the first submarine of World War II. The mighty USS Ward was on fire after being hit by a kamikaze plane. The USS O’Brien fired upon the USS Ward to sink the failing destroyer before implosion. As a result, USS O’Brien rescued multiple survivors. In the end, the United States lost three ships, while Japan lost 29 ships and one submarine. Charlie then headed to Mindoro in the Philippines Campaign to build an airstrip so troops could bomb in Manila every day. From there, he traveled in early January 1945 to Lingayen Gulf. Troops landed on Luzon, so they could begin invasion and charge into Manila. While in the gulf, 20 men were crowded together on his ship, only to be surprised by two Japanese planes bombing the USS O’Brien. One man was hit at his gun mount but recovered. In the next morning, the USS O’Brien fired 600 rounds of ammunition on the enemy. On Jan. 6, 1945, a Japanese kamikaze plane crashed into the port side of the fantail, causing slight damage. From this position, Charlie was on his way to Manus Island in Papua, New Guinea, for repair of his ship to carry him to Japan. On Feb. 10, 1945, he embarked with his task force on powerful air strikes against Tokyo and Iwo Jima. He then was directed to Okinawa to patrol. Charlie’s memoirs indicate Japanese sent 100 pilots at a time to battle and gave them orders not to return. At Kerama Retto, Okinawa, kamikaze planes eased into American formation on March 27, 1945. The third plane directly hit his ship, resulting in a large explosion. Torpedo tubes were damaged. Over 200 of the 350 men on board of the USS O’Brien were wounded, killed or missing. Fire was ever-present and danger was imminent. In total chaos, Charlie assisted a doctor on ship with casualties before he was called to the ammunition ready-room where he threw armament overboard to keep weapons from blowing up. A final count of 50 lost lives was logged on this day. During the summer, the USS O’Brien returned to California’s Mare Island Naval Shipyard for repairs. Charlie had a 25-day leave but was ordered to return to the Pacific and edge near to Japanese waters in the 3rd Fleet just before the atomic bomb dropping of Aug. 6, 1945. His ship escorted the mine-sweeps into Tokyo Bay prior to the nuclear explosion that end the war. His ship retrieved pilots from the ocean, who had ditched their planes after the bomb dropped and were unable to return to their aircraft carrier. Charlie conveyed he did not view the explosion firsthand, but he was nearby and amidst living history. Next up, we will conclude our look into the amazing life of a 22-year-old old seaman with a third installment set at the end of a brutal war. We will also explore the transition of Charlie Jacobus from sailor to head baker at Opryland Hotel, as well as his visible presence and contributions to Rutherford County.